What Is The Best Saddle Pad On The Market In 2019? What Is The Best Saddle Pad On The Market? It’s all very well having the best saddle in the world – but even the most well made saddle can pinch and rub, especially on long trail rides. Having a good, soft, protective saddle pad which is moulded to your horse’s back can make all the difference. If your horse is comfortable then you will have a much nicer ride – many “behavioural” issues actually arise because of discomfort. Walking, trotting, cantering and galloping for hours on end, whilst carrying the weight of an entire person, is not fun if your saddle digs in or pinches! A good saddle pad can make the world of difference, to you and your horse. There are many different ones out there, so how do you decide what is the best saddle pad for you? We are here to help by picking three of the best to help your decision! 2.1 1. Why do you need a saddle pad? 2.2 2. 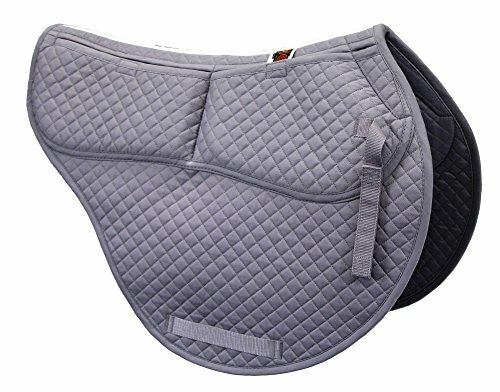 What are the styles of saddle pad? 2.3 3. What is a shaped saddle pad? 2.4 4. What is a square saddle pad? 2.5 5. What are pillow pads? 2.6 6. How do you pick the right size of saddle pad? 2.7 7. What can you do if your saddle tends to slip? 2.8 8. What kind of pad should you get? 2.9 9. Can you use padding to make a saddle fit right? 2.10 10. What about specialty pads? 2.11 11. What types of specialty pads are there? 2.12 12. Are natural or synthetic materials better? 2.13 13. How do you take care of a saddle pad? 2.14 14. How often should you buy a new pad? 2.15 15. What can you do with old saddle pads? This gorgeous saddle pad is ideal for Western riding as it is big and wide enough to sit under the saddle, and cover any places that might be rubbed. It’s one of the best saddle pads for horse with sore back. It’s a well made, luxurious saddle pad that will be a bonus for anyone wanting to ride comfortably, Western style. 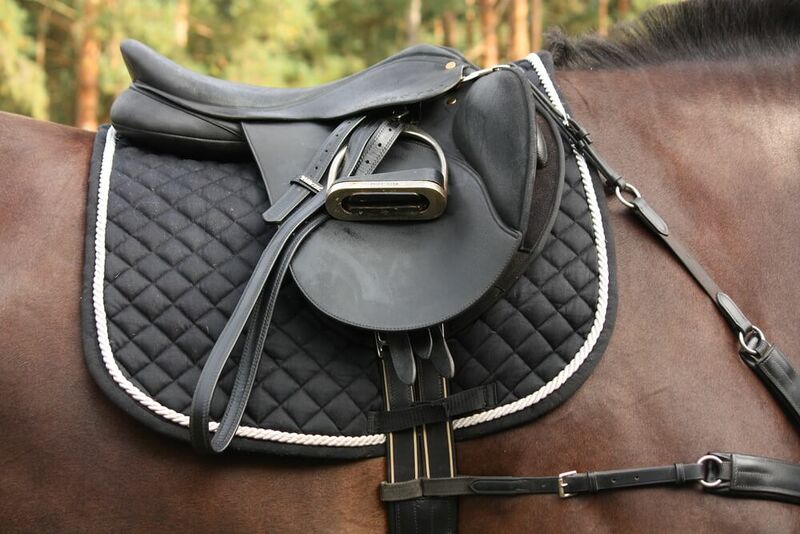 Reinforced leather spine – Having the sturdy leather over the spine ensures that the blanket and the saddle will not be rubbing on one of your horse’s most sensitive parts. Wither relief notch – Similar to the spine protection, having a space for the withers is great as it means one less place to potentially rub, especially if your horse is high withered. Moulds to your horse’s shape – After very little breaking in, this pad will fit your horse like a second skin. Durable and hardwearing – This pad is great for long rides, short ride, frequent or occasional use, and it will still maintain its quality. A really good investment! Could be thicker – Although it is one inch thick, some users have suggested that a thicker pad may be better. A great all round saddle pad suitable for Western riding, this one will protect your horse and keep them comfortable from pinching or rubbing, even on long trail rides. If you’re looking for a saddle pad with great back coverage that is perhaps not quite as large as one suited for Western riding, then this is your best bet. It is contoured to your horse’s shape, meaning less chance of the pad rolling or bunching up under the saddle. Merino wool fleece bottom – Merino is one of the softest wools out there, so will suit the most sensitive of horses. If you have a “princess and the pea” type of horse then this one will suit perfectly! Comes in a range of colors – If you are looking for a quirky color to stand out from the crowd, then this one is perfect, as it is available in a wide selection of colors to match your style. Easy to clean and quick to dry – This is essential because, as we all know, horses can really sweat. This pad is easy to clean, and you won’t have to wait for days for it to be dry enough to use again! 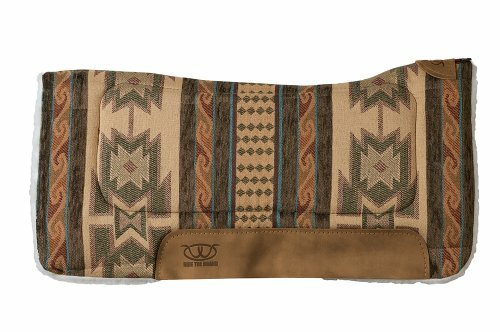 Perfect for smaller saddles – If you love trail riding but a Western saddle is not your thing, you can opt for this saddle pad for optimum protection. Not suitable for horses with special needs – If your horse has health issues such as swayback, for example, you would be better off finding a specifically tailored pad, as this one is for the standard, average back. A beautiful saddle pad which will protect your horse’s back against the rigours of a long trail ride, and is perfectly suited to the smaller saddle. The range of colors is a massive draw too! If you are looking for a great saddle pad that suits English or Australian saddles, then this is your best pick. It’s wider than the saddle itself, so will ensure no rubbing, and the memory foam is great at shock absorption. Can be tailored to your horse – Supplied with memory foam inserts, this saddle pad can be customised to your horse’s specifics. Sleek and streamlined – You can now get perfect protection for your horse, without huge amounts of bulky fabric. This makes it great for sporty and competitive riding. Lightweight and easy to wear – This is a pad that is slim enough to be lifted onto your horse with the least amount of effort. It will also reduce the extra weight he is carrying, as it is light and easy to carry. Takes a lot of use to lay flat and comfortable – Some users have reported that this pad doesn’t “wear in” as quickly as others. A great saddle pad for those wanting a good amount of protection for the English-type saddle. It is shaped like an English or Australian, and is long and wide enough to fit both. The fact that you can add or remove the provided inserts to make the pad fit your horse perfectly is a massive bonus! 1. Why do you need a saddle pad? The saddle pad protects your horse’s hair, skin and back from friction and pressure while simultaneously protecting your saddle against dirt, grime and sweat. 2. What are the styles of saddle pad? Half pads may be used for any discipline and may be used alone or with another pad. Shaped pads are mostly used for hunting and jumping. Square pads are mostly used for dressage. Pads for use with western saddles are also square and are larger than those used with English tack. Saddle blankets are also used in western riding. 3. What is a shaped saddle pad? These pads are curved to fit perfectly with your saddle (all purpose, dressage or jumping). They come in cotton, sheepskin, fleece or a combination of these materials. 4. What is a square saddle pad? These pads are available in many different colors and stitching patterns. They often have an inner layer of foam for extra padding, along with a moisture wicking lining to provide even more comfort for your horse. 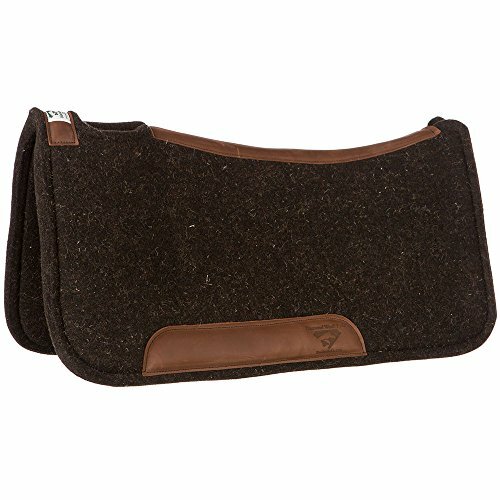 For all-purpose or jumping saddles, you can purchase a square pad that is shaped to accommodate the saddle’s knee rolls. 5. What are pillow pads? These pads are quite a bit like square pads, but they are more cushioned to provide even more comfort for your horse. This can be helpful if your saddle is a bit large for your horse, but if your saddle fits perfectly, the extra thick padding can be cumbersome and may cause problems. 6. How do you pick the right size of saddle pad? You must consider the style and seat size of your saddle. Seat size is the distance between the center of the cantle (back of the saddle) and one of the screw heads found in the side of the pommel (front of the saddle). Your pad should be large enough to create a 2″ border all the way around the saddle. 7. What can you do if your saddle tends to slip? Be sure you are tightening your girth properly and look for a pad that has non-slip panels or that is lined entirely with a non-slip material. You may also get a very thin, non-slip pad to fit under your existing pad. 8. What kind of pad should you get? Consider your riding discipline and your expectations of the saddle pad when you choose. If you show or hunt, you’ll want a pad that is correct for your discipline. Simultaneously, you’ll want it to meet your horse’s needs in terms of cushioning, comfort and absorbency. 9. Can you use padding to make a saddle fit right? Ideally, your saddle should fit your horse correctly so that you only need a simple pad to provide protection for your horse’s back and your saddle’s interior. In some instances, a little extra padding here or there can help adjust the fit of a saddle, but don’t go overboard with this. Too much padding can cause more pressure and may prevent you from getting a safe, secure fit. 10. What about specialty pads? For horses with back problems, such as sore spots or high withers, you may need to look for a pad that is specially designed to help deal with that problem. The right specialty pad can help reduce friction, trauma, heat and pain. You may use a specialty pad in place of, or along with, other types of pads. 11. What types of specialty pads are there? Wither back pads have open slots at the withers to relieve spinal pressure. Foam pads and gel pads distribute weight evenly and provide extra padding against impact. These help prevent and relieve back soreness. Riser/Lift back pads elevate the cantle and can be helpful to the rider if the saddle seat tips backward; however, this may not be helpful to the horse as a backward tilting seat usually means the saddle is too narrow to fit the horse comfortably. Lift front pads elevate the pommel if the saddle seat tilts too far forward. Again, this may help the rider and not the horse as a saddle usually tilts forward if it is too wide to fit the horse properly. Correction pads are equipped with thin shims that you can use to tweak the way the saddle sits on your horse’s back. This is helpful if the horse is a bit asymmetrical. No-slip pads may be used under other pads to prevent the saddle from slipping. If you are seeking to correct a combination of problems, you’ll be happy to know that there are many combination pads to choose from. 12. Are natural or synthetic materials better? Sheepskin and wool pads conform to the contours of your horse’s back, wick moisture away naturally and provide good air circulation under the saddle, but they are costly and can be hard to keep clean. Cotton is inexpensive, easy to launder and absorbent, but it is not as absorbent as sheepskin or wool. Synthetic pads are less expensive and easier to keep clean but may not be very absorbent. 13. How do you take care of a saddle pad? Shake the pad out, brush it with a dandy brush and store it with the underside exposed to air to dry out after every ride. Never lay your pad down on the ground or on hay or other materials that might stick to it and cause your horse discomfort. Buy some “baby pads” to use under your saddle pad. These very thin, easy-to-launder pads are specially made to protect your saddle pad from dirt and sweat. Launder your saddle pad when it becomes dirty. Remember that natural wool or sheepskin must be treated as a delicate item, washed gently with natural soap and hung or laid flat to dry. Synthetics and cotton can be washed with a good quality of laundry detergent and dried in the dryer. Use a hypoallergenic detergent to avoid irritating your horse’s skin. 14. How often should you buy a new pad? This really varies depending on how much you ride, how much weight your horse tends to lose or gain seasonally, whether or not you clip your horse in winter, how thick his winter coat is and many other factors. You may need several sets of pads that you rotate seasonally. Just keep a close eye on the condition of your saddle pads and the way they fit. When they begin to show wear, replace them. 15. What can you do with old saddle pads? Don’t throw those old pads away! They make excellent dust covers for saddles that are not frequently in use. If you have barn cats or dogs, they will surely appreciate these nice, comfy beds. Retired saddle pads that will never be used again make a nice cushion for your own tush if you want to sit on the ground or on a bale of hay to enjoy your lunch. Whether you are going for short or long rides, 6 times a week or once a month, your horse’s comfort is paramount. Having comfortable riding gloves or a good saddle is a great start, but having a great saddle pad is really essential. For those interested in perfect protection for the Western style saddle, the Diamond Wool Contour Felt Ranch Pad is for you. If you are looking for comfort for smaller saddles and trail riding the Weaver Leather All Purpose 30” x 30” Contoured Saddle Pad with Felt Insert & Merino Wool Bottom is the one to go for. If you are looking for a good, customizable pad for English and Australian saddles then the ECP Cotton Correction All Purpose Contoured Saddle Pad – Memory Foam Pockets will be your best bet. I feel like the saddle that is more simple than complex is better for the rider AND the horse. I have used a few different kinds, but find myself always going back to the simple, wool saddle I started out with. Maybe that just means it was broken in properly.